Bill Dandoy has been a sheriff's deputy for more than two decades. 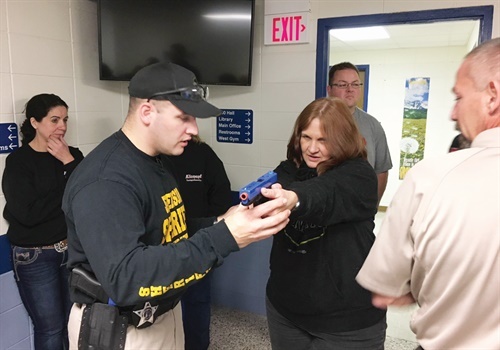 He became a deputy at the Jefferson County (WI) Sheriff's Office to enforce the law and to help others, but one of the brightest spots in his career has been running the agency's citizens police academy (CPA). So much so, that he often gives his time to it in exchange for a day off, rather than collect overtime pay. "It brings some positives to what can sometimes be a very lonely job," he explains. "Not only does the CPA help build trust in the department, but it's had a positive effect on our deputies. They get to be reminded that there are people out there who support us and our mission." He explains that though he's a day-shifter now, he worked second and third shift for many years, where he encountered everything from domestic disputes to situations caused by alcohol and drug abuse. Being exposed to often negative encounters, day in and day out, can wear on law enforcers, but he says this program reminds them they are not alone; that good people stand behind them. He adds, "It's good for law enforcement officers to share a bit of what they do in a positive environment, such as a citizen's police academy." Jefferson County started its CPA approximately 22 years ago, and Dandoy has headed it for 20 of those years. Over the years, nearly 400 people have taken the class; 16 students at a time. And, some have taken it twice. "The demand has gotten so high that last year we started doing two academies a year," he says, noting that typically the class is full before he even issues a press release about it taking place. He explains that though occasionally he lets in one or two extra people, he tries to keep the 11-week classes, which run from 6-9 p.m. one day a week, to 16 students. "This seems to be a good number to give everyone a good hands-on experience, and keep our hours firm," he says. "People are drawn to the class by a general interest in law enforcement, whether it's because of years of watching cops on TV, seeing the stories in the news, and so on. This gives them a chance to get an inside look at what we do." The curriculum the department has developed over the years requires classes to be small. Though there is an introduction in a classroom the first night, most evenings are spent engaged in activities that do not require a binder filled with instructional materials or a desk. 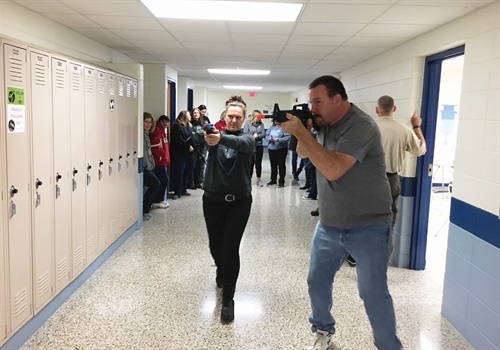 Instead, participants may find themselves handcuffing a "suspect," driving a patrol car and making a traffic stop, viewing a correctional emergency response team (CERT) or K-9 demonstration, investigating an "accident," collecting evidence at a "crime scene," shooting a firearm, or participating in active shooter training. Dandoy says he arranges the class in the way he'd want a class to be run if he was using his personal time to take it. He explains, "I want to get out of my chair and do something. We designed our program so that people are not spending three hours sitting in a chair. We want them to take some great memories along with them, and to experience the situations that we do." He explains they give participants actual scenarios to deal with. For example, a dispatcher might call them to an underground garage and tell them they are being sent there because someone suspicious has been spotted milling around the cars. "The students are on hyper alert because they are fully expecting something terrible to happen, but it might be that someone just dropped their car keys," he says. "Other times they will encounter a suspect and have to take appropriate action." An eye opener for many students is the use-of-force and handcuffing demo, where deputies teach participants how difficult it is to handcuff someone when they are standing still, let alone fighting with them. That night also includes a TASER demonstration, and many participants volunteer to get hit by a TASER to see what it feels like. "I videotape that, and post the videos on YouTube, so they can share them with family and friends," he says. Dandoy routinely takes participants to Deerfield Pistol & Archery Center in nearby Deerfield, WI, for a night at the range. Here, students shoot a handgun, but they also participate in video simulator training where they answer calls and must decide whether to discharge their weapons. "They have to make a split-second, shoot-or-don't-shoot decision," he says. "The simulator tracks where they point their gun, where their shots were fired, if they hit the assailant and stopped the threat, if they were hit, etc.," he says. "That experience for people is a real eye-opener. They realize the tiny amount of time there is to make that decision, and sometimes they make the wrong one." Active shooter training was added a few years ago, because Dandoy says it helps participants learn to respond to these situations as both citizens and officers. The scenarios take place at Lakeside Lutheran High School in Lake Mills, WI, and involve an actual simulation with Airsoft guns. "I teach active shooter response to civilians, primarily in our schools, but also in businesses and churches. Studying active shooter events and figuring out effective responses to them has been my world since Sandy Hook," he says. "Teaching CPA participants how we respond to these events opens their eyes to some of the challenges officers face and how we train for them." Dandoy says students respond in unexpected ways during these simulations. Sometimes, participants are naturals and, once in this tactical situation, they have no problem busting into the area where the shooter is holed up. Other times, participants must be forced to enter the room, even though they know the situation isn't real. "It is not a natural response for anyone to dive into gunfire, and when they have to do it—even when it's just a pellet from an Airsoft gun—they are petrified," he says. "Sometimes we get a good laugh, like the time we had a participant start firing at everyone in the room. There was only one bad guy, but she shot everyone." Not every night is action-packed, however. Some nights tug at the heart strings. Dandoy explains that on law enforcement spouse night, husbands and wives of law enforcement officers share how the job impacts their families. When Deputy Mike Williams talks about the murder of his brother, Deputy Bruce Williams of the Green Lake County (WI) Sheriff's Office during a domestic dispute, there is usually not a dry eye in the house. The course ends with a celebration for participants and their significant others, where the jail cook, a former U.S. Navy chef, prepares the meal, and an awards ceremony follows. Participants receive a plaque, CPA T-shirt, and a 4x6 photo of themselves at the range. Of course, a class like this costs money, and for many cash-strapped departments this can present an unsurmountable barrier, but Dandoy says Jefferson County Sheriff's Office funds this educational effort because of the benefits it brings. "Our biggest cost is overtime for the deputies that teach the classes, which can be as many as five deputies some nights. As much as possible we try to use deputies who are on duty," he says. "Of course, the bad guys do not always cooperate with this schedule, and then I have to bring in a deputy to teach the class." Sometimes other departments visit Jefferson County to see its CPA program in action, and Dandoy welcomes the opportunity. He offers a few suggestions to them when they do. One, if money is an issue, he suggests a shorter program that is easier to fund. He also recommends appointing a person to oversee the program and keep it going. Finally, he recommends finding a way to do it, if they can. "We are in a battle to build public trust right now, and we don't have a lot of good tools to do that. This is a great tool to build trust," he says, noting that law enforcement has been at a disadvantage since the Ferguson, MO, unrest in 2014. Now officers battle for trust as the media releases unsubstantiated facts before law enforcement has finished their investigation. When this happens, Dandoy says "rumors fester and spread, and trust in law enforcement erodes." "Our goal is to send away 16 law enforcement advocates at the end of this program. I want people to be able to take that negative news story on the nightly news and be able to critically think about it from a different perspective and engage others in the conversation," he says. "I also want them to know that this is their sheriff's office, and we work for them. We want them to understand what we're doing and why we do it the way we do. If we can engage our citizens here, we can create a partnership with them where they know they can trust us." Ronnie Garrett is a freelance writer based in Fort Atkinson, WI. She has been writing about law enforcement-related topics for 22 years. An officer with the Charleston Police Department was reportedly struck by a bullet when a gun was accidentally discharged during training at the agency's firearms range on Monday afternoon. Two officers with the Elk Grove (CA) Police Department were wounded when a suspected burglary suspect reportedly opened fire on them on Saturday night.